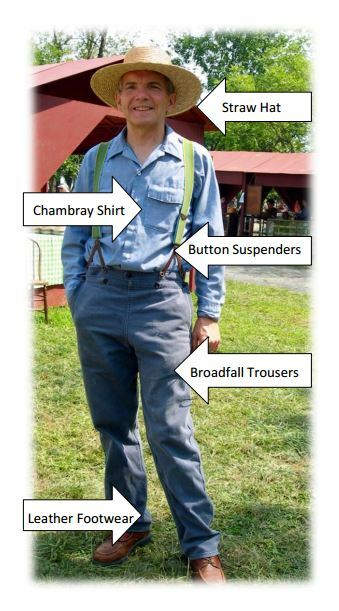 The everyday summer clothing of the Pennsylvania farmer in the last half of the 18th century consisted of a bleached homespun tow or linen long sleeved shirt, knee breeches or long trousers, a vest, neckerchief, shoes and stockings. Because the Goschenhoppen Folk Festival takes place during the summer you will probably not see anyone wearing a coat over their vest. The knee breeches for the farmers of the time period were made of cloth (tow, linsey-woolsey, worsted wool, linen) or leather. The breeches fit tightly around the knees and the thigh so the material of the leg would not rise when they sat down, but loosely in the rear so they could sit down without tearing the fabric. The waistband is secured with buttons in the front and the back has a laced adjustable front fall in place of a modern day zippered or buttoned fly. Shirts are worn tucked in the knee breeches or trousers. The neckerchief can be worn on top or underneath the shirt collar and tied in a double knot under the chin. During the summer the women of the Goschenhoppen region wore a homespun linen shortgown and petticoat as her basic attire. White caps of linen or handkerchief linen were worn during the 18th century. When the cap was in place and tied under the chin very little hair was visible. The flat hat was worn on top of the cap while working outdoors or traveling. The shortgown was a long-sleeved bodice with a peplum or extension below the waist which was worn over a petticoat. The shortgown is closed with straight pins (or thorns of the prickly ash) and a drawstring at the waist in the center front. A triangular kerchief is worn over the shoulders and pinned to the shortgown in the center front. In the 18th century the term petticoat was used to designate what we now call a skirt. Petticoats were hemmed to be about 4 inches above the ankle. The apron was worn either over or under the shortgown's peplum. Usually it is shorter than the petticoat and quite a bit narrower. The width of the apron did not exceed the side seams of the petticoat. As in modern day you will see festival participants dressed in many different styles of clothing. This is an example of the clothing that we loan to participants who do not have their own. Chambray is a type of plain weave fabric woven with a white or unbleached thread crossed with a colored thread. In this case it is white and blue threads which give a soft worn look to the fabric. Broadfall trousers have a drop front that goes from hip to hip and is fastened with buttons at the top. This is in place of a modern day zippered fly. They also have buttons on the waistband to attach the button suspenders (or braces). As in modern day you will see festival participants dressed in many different fabrics and styles of clothing. Old pictures reveal that women's work dresses had assorted trims, ruffles, tucks, pleats, bodice yokes and gathers. Women's summer work dresses were usually made of cotton using a calico print, stripe or floral stripe, or a plain dark color. The cut of the floor length dress was comfortably full with a high neck and long sleeves. 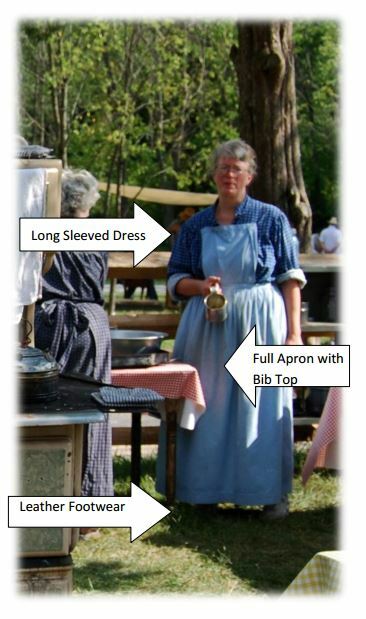 Women were long aprons on top of their work dresses that extended from the waist to near the hem. The apron was full and wrapped almost enitrely around the body to tie in a large bow at the center back. Front pockets are sometimes visible in old pictures. The apron pictured has a bib top pinned to the bodice of the dress.